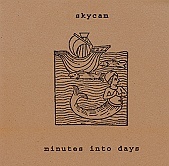 Lo-fi, heavily layered indie rock, Skycam delivers a muddy, yet still melodic set of songs. They easily go from blasting guitars and throwing down a loose, jangly beat to sparkling, jagged rock, using a female vocalist in the background to add a pretty layer of harmony while the band keeps things loose and rockin'. They've got room to go, but they're starting to blossom. I'll give this a B-. Sky Cries Mary: Until the Grinders Cease Skyline BLVD. : Skyline BLVD.